From the acclaimed author of The Great Believers, an original, mordantly witty novel about the secrets of an old-money family and their turn-of-the-century estate, Laurelfield. Meet the Devohrs: Zee, a Marxist literary scholar who detests her parents’ wealth but nevertheless finds herself living in their carriage house; Gracie, her mother, who claims she can tell your lot in life by looking at your teeth; and Bruce, her step-father, stockpiling supplies for the Y2K apocalypse and perpetually late for his tee time. Then there’s Violet Devohr, Zee’s great-grandmother, who they say took her own life somewhere in the vast house, and whose massive oil portrait still hangs in the dining room. Violet’s portrait was known to terrify the artists who resided at the house from the 1920s to the 1950s, when it served as the Laurelfield Arts Colony—and this is exactly the period Zee’s husband, Doug, is interested in. An out-of-work academic whose only hope of a future position is securing a book deal, Doug is stalled on his biography of the poet Edwin Parfitt, once in residence at the colony. All he needs to get the book back on track—besides some motivation and self-esteem—is access to the colony records, rotting away in the attic for decades. But when Doug begins to poke around where he shouldn’t, he finds Gracie guards the files with a strange ferocity, raising questions about what she might be hiding. The secrets of the hundred-year house would turn everything Doug and Zee think they know about her family on its head—that is, if they were to ever uncover them. In this brilliantly conceived, ambitious, and deeply rewarding novel, Rebecca Makkai unfolds a generational saga in reverse, leading the reader back in time on a literary scavenger hunt as we seek to uncover the truth about these strange people and this mysterious house. With intelligence and humor, a daring narrative approach, and a lovingly satirical voice, Rebecca Makkai has crafted an unforgettable novel about family, fate and the incredible surprises life can offer. 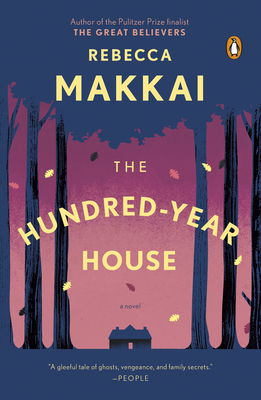 Rebecca Makkai is the author of the acclaimed novels The Hundred-Year House and The Borrower, an Indie Next pick, an O, The Oprah Magazine Fall Reading selection, a Booklist Top Ten Debut, and one of Chicago Magazine's choices for best fiction of 2011. Her work has appeared in The Best American Short Stories (2011, 2010, 2009 and 2008), Best American Nonrequired Reading, Harper's, McSweeney's, Tin House, Ploughshares, Iowa Review, Michigan Quarterly Review, and New England Review, among others, and has aired on "This American Life." She lives outside Chicago with her husband and two daughters.